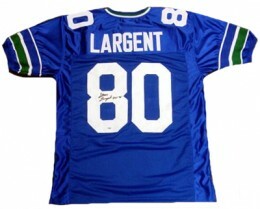 Steve Largent spent his entire 14-year career with the Seattle Seahawks. 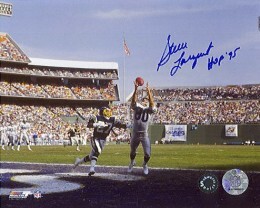 He quickly became a fan favorite who was appreciated for his willingness to take a hit to make the catch. He retired holding several receiving records. He enjoyed a successful career in politics after his playing days. 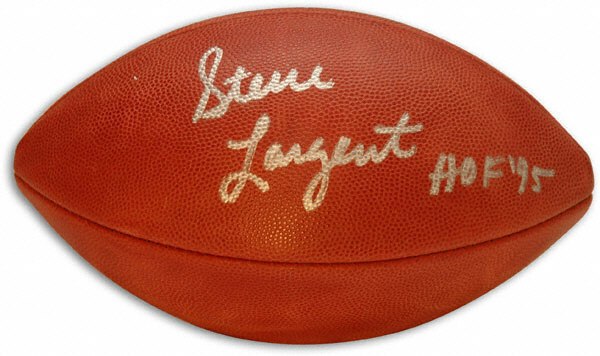 Steve Largent cards and autographed memorabilia are very affordable and perhaps a little under-valued in today's market, creating a potential investment opportunity. 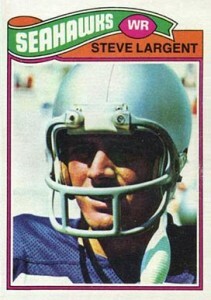 Largent's rookie card is from the 1977 Topps Football set. He was also included in a set that Topps released to the Mexican market. Additionally, Largent has two over-sized Seattle Seahawks team-issued cards from 1977 that measure 5 x 7 inches. His most popular early autographed card is from the 1991 Pro Line Portraits set. None of the cards in the set are serial numbered. Largent's first memorabilia card can be found in the 2000 Leaf Certified Heritage Collection insert set. The regular version is numbered to 100. An un-numbered Century parallel has 21 known copies despite not being serial numbered. Because of Steve Largent's involvement in politics, his autographed memorabilia has cross-over appeal with both sports and political collectors. He is a willing in-person signer and has been an occasional guest at sports collectibles shows. This card was produced at a time when Topps didn't have an NFL license for football cards. 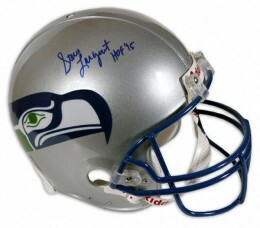 Largent's helmet has been airbrushed of the well-known "Seahawk." Graded Near-Mint copies are very affordable and makes for a solid addition to any collection. Below you will find examples of what an authentic Steve Largent autograph looks like. This can be used as a first point of reference for determining the legitimacy of autograph memorabilia, but is not a substitute for having your items authenticated by a well-respected professional autograph authentication company. Some of the trusted sources within the sports memorabilia market include the following companies: PSA, JSA, Tristar, and Mounted Memories. Click on any of the images below to view full size photos. It is a legible signature, written in cursive on a horizontal plane. The letters in the first name are narrowly spaced. The cross of the letter "t" intersects the letter "S."
The "L" has two similar loops on the top and bottom of the letter. The remaining letters are small. The "g" has a sizable loop that drops below the plane. The "t' is formed with a narrow cursive "l" shape and then crossed.